The decision to invest in the largest MACH exhibition stand in the Group’s history proved to be a correct one as record numbers of visitors visited the Ceratizit WNT stand over the five days of the show. 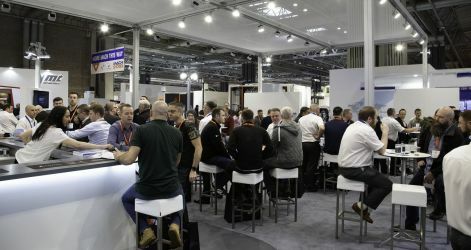 With the stand design focusing on industry sectors and how Ceratizit WNT cutting tools and workholding solutions can maximise productivity for customers, there was a constant stream of visitors keen to learn more. 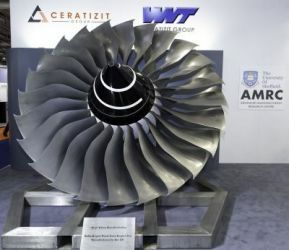 Beyond the cutting tools the star attraction on the Ceratizit WNT stand was the impressive Rolls Royce Trent fan disc as used on the Airbus A380 aircraft, which was on loan from the Advanced Manufacturing Research Centre (AMRC), which the Ceratizit Group is a Tier One Member. “The fan disc drew lots of attention and is typical of how we are providing smart and industry-focused solutions to manufacturing companies. The components in the disc and other elements of the engine are machined using Ceratizit Group tools. “MACH is also a good opportunity to gauge trends and our perspective, as a supplier of cutting tools, it is encouraging to see that the high level of capital spending on machine tools continuing. We had some very positive conversations with people from small, medium and large businesses, who are all in a positive mindset. We were also encouraged by conversations we had with those working in the oil and gas sector, where the feeling was one of that area gaining strength again, with customers reporting themselves to be very busy again,” says Tony Pennington, Managing Director.